During the cool months, bread pudding is a dessert I enjoy making. It's soft with a slight custard texture in the middle and has a toasty, crunchy top from baking. Even better is that it's made with some common pantry ingredients including bread, milk, sugar and eggs. 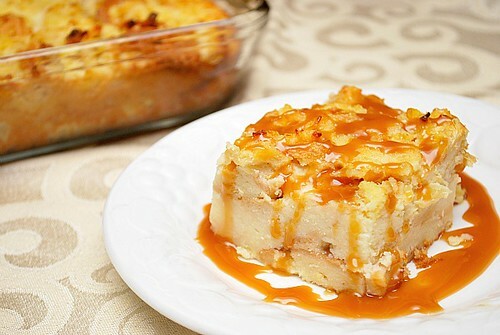 To give it some character, this specific bread pudding includes crushed pineapple, coconut milk and rum extract. To finish this off, a buttery caramel sauce is drizzled on while it's still warm. Yum! Preheat oven to 350 degrees. Place the bread in a large bowl and set aside. In another bowl, beat eggs with sugar in bowl. Add undrained pineapple, coconut milk, and milk. Blend well. Add rum extract. Pour over bread cubes and allow to soak 15 minutes. Transfer mixture to a greased baking dish and bake in the preheated oven for 45 minutes. Remove pudding from oven and allow to cool. Serve with caramel sauce.